Jan 2014: My first day at Aidha. I arrived hobbling in an uncomfortable brace to keep a broken foot in place at the tiny shed (oops, office) in Short Street, overrun outside with weeds and stray cats, wondering what I had signed up for. Inside, it turned out to be a mini United Nations assembly of smart, dedicated women, and there was no mistaking the team’s passion and dedication to the cause. The accents were to change quickly and repeatedly as members of the team left on postings elsewhere, went home, or to have children, and new ones joined. I enjoyed working with such a multi-cultural group as they infused Aidha with a freshness of thinking. Lunch times proved an endless source of learning as we traded information about each other’s cultures, food and language. To this end, I have acquired all kinds of culturally vital knowledge, such as that no self-respecting Italian will ever drink a cappuccino after lunch. Things seemed to move at breakneck speed from Day 1. 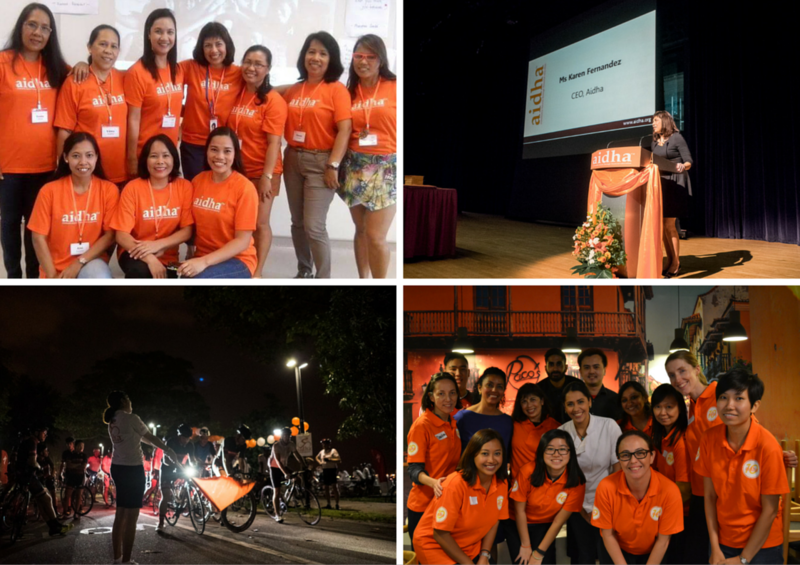 In February 2014, we held our annual Aidha Tour de Singapore Bike Ride fundraiser; the next month, we had found a fantastic new campus at UWC, moved over 800 students, and ran classes on our very first day there! Sourcing for a bigger campus that was open on Sundays, accessible by public transport and at a rental that we could afford was not without its challenges but it is amazing what can be achieved with a great team and a certain amount of ‘Just do it’ naiveté. The next three months were hardly any quieter as we hunted for and moved into a new administrative office, an atmospheric converted shop house in North Bridge Road. In July 2014, while the builders were still completing the final touches, we held our Board meeting in the afternoon and later that evening, squeezed 45 guests into the tiny, overcrowded space to celebrate Aidha’s 8th birthday party. The new Philippine Ambassador, who had only arrived in Singapore days before, gamely celebrated with us, downing cupcakes and teh tarik. Two record breaking graduations of 110 (Nov 2014) and 166 students (Nov 2015) will be among my most memorable moments. Standing at the podium, peering into the darkened auditorium, I will never forget the excited, beaming faces of students who had, though sheer grit, determination and hard work, got to this place. The two new programmes introduced in 2015 to enable our students to continue with the progress they had made – the Alumni Development Programme and our English classes – are other high points. April 2015. After months of drafts and re-writes, meetings, back-and-forths with regulatory bodies, an innocuous email pinged late one Friday afternoon in my Inbox announcing Aidha had achieved IPC status. No fanfare, no congratulatory letter, just a short, terse email with that momentous announcement! What was even more heart-warming was the jubilant responses of our major donors and supporters when I immediately called to share the good news with them. A small organisation like Aidha is highly dependent on the backing of its supporters and ours have never let us down. They have also been very generous in sharing their time and counsel whenever I needed it and I am truly grateful to have had the benefit of such experienced mentors. So… truly a rollercoaster of a ride and one I would not have changed for all the world! Having been with several other non-profits, I can honestly say that I have never met a more big-hearted and dedicated group of volunteers than at Aidha. I am privileged to call some good friends now. I have learnt many invaluable lessons, including the fact that sometimes, when dealing with a group of highly intelligent, passionate women, democracy can be quite overrated! Most of all, I have been moved, awed and humbled by all the students I’ve been fortunate to meet and represent. Their focus, tenacity and good-naturedness, despite the sometimes impossible challenges they face, has made me realise that yes, life is unfair and random, but hopelessness is worse. Sometimes, you don’t have to make big grand gestures: just by creating a little opportunity and by believing in someone, you can really make a difference. This entry was posted in CEO Message. Bookmark the permalink.